Like all other Bulgarians, the residents of Haskovo celebrated the declaration of the Russian-Turkish War in 1877. 23 volunteers from the town and the region enrolled in the Bulgarian Army to help gaining the long waited liberty. The withdrawing to Odrin and Constantinople Turkish troops became a real disaster for Haskovo, which was subjected to great plunder and violence. The Bulgarians were forced to organize alone the protection of their neighbourhoods until the coming of the Russians. In July 1877, the vanguard of General Gurko conquered Kayadzhik (now the Quarter of Rakovski in Dimitrovgrad). Impatient to meet the liberators, many Haskovo residents went outside the town, waiting to see them. The advance of Suleyman Pasha, however, forced General Gurko to turn his smaller in number army back to Stara Zagora. 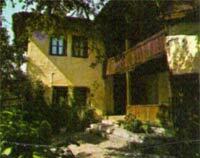 Tens of people from Haskovo were hung, others were slaughtered or put into prison. After the liberation of Sofia, the situation in the South worsened again because of the running away towards Turkey remainders of the Suleyman Army. The Bulgarian villages near Haskovo once again were plundered and put on fire. On 31 December the Turkish Governor and his clerks left the town, followed by almost the whole Muslim population. More than 50 houses and shops in the centre of town were robbed and over 20 people killed. The goods, which they couldn’t take were gathered in pile in front of the clock tower and put on fire. Later in the evening came the news that the Gurko’s Army was approaching the town and the people of Haskovo should not run. 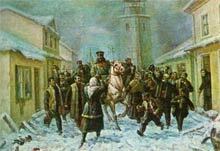 On 8 (20) January arrived the Army of General Skobelev – Junior, which by the village of Stoykovo defeated the withdrawing Turkiksh Army. On the next day came the armies of General Kartzov consisting of 8 thousand soldiers and 12 cannons. Two battalions were left to guard Haskovo and the remaining army was sent to the near villages chasing the remnants of the Turkish army. On 12 (24) January the residents of the town enthusiastically met the great Russian general – Gurko, who was accommodated in one of the best Bulgarian houses in Haskovo (now – restaurant – “The Gurko’s House). Another interesting fact is that here for the first time in the war the two Russian Generals bearing the name Skobelev met – a father and a son.